A 5 ounce Angus breakfast steak, two eggs any style, country potatoes and toast. Two eggs - any style, country Potatoes, Bacon or Sausage, Biscuit and sausage gravy. Two eggs any style, Bacon or Sausage Patty, and two pancakes. 2 Eggs any style, choice of Bason or Sausage Patty, Hash Browns -OR- Country Potatoes. Choice of Toast. Three Buttermilk Pancakes. Served with Butter and Syrup. Choice of Bacon or Sausage. Three Eggs scrambled with Chorizo and Country Potatoes, Topped with fresh Pico De Gallo and Pepper Jack Cheese. Choice of Toast. Two Eggs any style, Ham Slice, Hash Browns -OR- Country Potatoes. Choice of Toast. Three Eggs scrambled with Country Potatoes, Onion, and Green pepper, Real Bacon Bits all topped with Cheddar Cheese. Choice of Toast. Country Potatoes, bell Pepper & Onions, topped with Real Bacon bits and Cheddar cheese. Items marked with a are served cook-to-order, undercooked or raw meats; poultry, seafood, shellfish or eggs may increase your risk of food borne illness. Omelettes are prepared to order using only the freshest ingredients. Our Cream Cheese Herb Blend with Fresh Spinach & Mushrooms. Served with Hash Browns -OR- Country Potatoes. Choice of Toast. Three Eggs with Choice of any THREE Items listed below. Served with Hash Browns -OR- Country Potatoes. Choice of Toast. Country Fried Steak with sausage gravy, two eggs, country potatoes & biscuit. Quiche of the Day served with fruit cup and muffin. Served with Choice of Coleslaw -OR- Fries. Angus Burger with Grilled Onions on Grilled Sourdough with Swiss Cheese. Corned Beef, Sauerkraut and Swiss Cheese on Grilled Marble Rye with Thousand Island Dressing. With Grilled Onions, Mushrooms and Peppers. Oh, and Lots of White American Cheese. Crisp bacon, Lettuce and Tomato on Toasted Sourdough Bread. Velvety mixture of Tuna with mayo and chopped onion. Grilled on Marble Rye Bread with Provolone Cheese. Thinly sliced Ham layered with Swiss Cheese on Grilled Marble Rye. Creamy Chicken Salad topped with Provolone on Grilled Parmesan Bread. Layers of Turkey, Ham, Provolone and Cirsp Bacon with Lettuce, Tomato and Mayonnaise on Toasted Bread. Grilled Chicken Breast with Lettuce and Tomato and Mayonnaise on a Toasted Bun. Served with our Home-Made Potato Chips -OR- Creamy Coleslaw. Served with Lettuce, Tomato and Mayonnaise. Sliced baked Chicken Breast, sliced Strawberries. Feta Cheese Crumbles on a bed of Crisp Romaine with Raspberry Dressing on the side. Crisp Romaine, Turkey, Ham, Crisp Bacon Crumbles, Shredded Cheddar and Tomato. A Scoop of our Creamy Salad served on a bed of Crisp Romaine Lettuce with Shredded Cheddar & Tomato Slices. Crisp Romaine, Shredded Cheddar, Fresh Mushrooms, Tomato, Bell Pepper & Onion. Choice of Dressing. Ask aout our soup of the day. Our beans are roasted locally in small batches to bring you the freshest bean we could find for our house blend, Heavenly Bliss. Available in full or half pound. Ground or whole bean. Our Coffee is roasted in small batches to give you the best we could find. 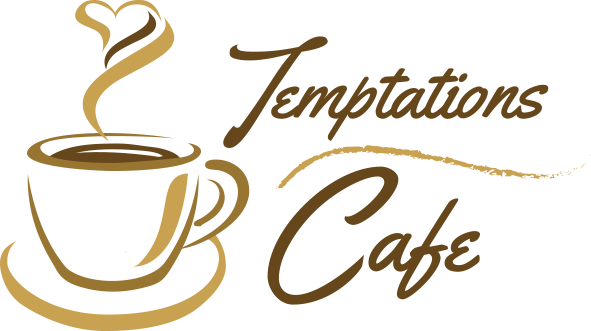 Specific roast to Temptations cafe. In house bottomless cup. Espresso, caramel, Chocolate, steamed milk & whip cream. Espresso, chocolate, steamed milk & whip cream. Espresso, caramel, French vanilla & Steamed milk. Espresso, hot milk, and steamed-milk foam. Refreshing iced blended drink of espresso, frappe mix, with choice of flavoring & topped with whip cream. Nourish your yin and elevate your yang with this creamy blend of tea, spices and milk. Hot or over ice. Made with Chai tea, coconut syrup & milk. Topped with whip cream & toasted coconut. Creamy hot chocolate, steamed milk, marshmallows & whip cream. We carry a variety of tea. Lemon & honey on request.